When a child turns one soooo many things just seem to get easier. Whole milk – much less stressful than breastfeeding or even formula feeding. Naps and night time sleep – still vital but if you’re a few minutes late putting them down or early getting them up it doesn’t seem to phase them as much. They become easier to communicate with, to understand their needs, and more fun to play with too! They seem less breakable, funnier and somehow more human. 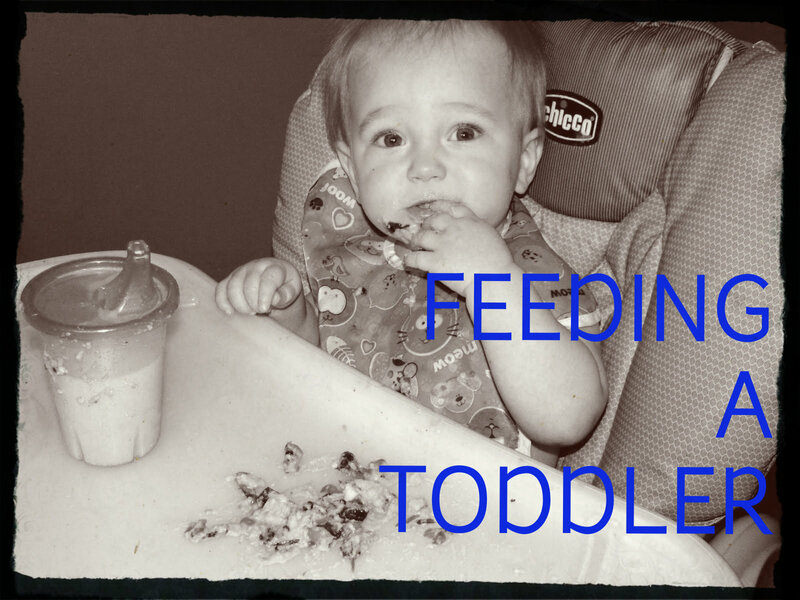 To me, there is one thing that has gotten more stressful with the age of toddler…food. Even though I’ve been feeding Kye “real” food for quite some time I never had to stress about it. Everything you read constantly reminds you that for up to the first year the breast milk/formula is ALL your baby needs for nutrition. After that though, it’s up to YOU to make sure they get the nutrients they need. It’s stressful. As a life-long picky eater I want to do my best to get Kye to not only eat healthy but enjoy healthy foods. It’s my personal goal. I also feel very strongly that as long as I control what he eats then I should make sure he’s eating the healthiest things he can. Am I a freak about it? No. Sure my kid eats hot dogs now and then. Sure he eats dessert with us if we’re all having a little treat after dinner. And no, I’m not one of those omg-if-it’s-not-organic-then-it’s-not-entering-my-child’s-mouth moms. I wish we could afford to be more organic. I think that a LOT of the organic thing is bogus and used for a marketing tool but I FIRMLY believe that majority of the health issues we have today come from the processed crap we eat. Like my mom said, everything naturally from the Lord is good…stuff that humans mess with is the stuff to avoid (which is like EVERYTHING!). I do try to buy organic, when available, on the items from the Dirty Dozen list. and I feel confident in going by this “pyramid” for Kye’s nutritional needs. A serving size for ANYONE is an amount that fits in their palm. I consider a serving a Kye-sized-handful of whatever the food may be. (you can also assume 1 tablespoon per year of age is about right). This list is my own in order of importance and I go by this everyday when I decide what Kye should eat. I do this order because Kye likes green veges the least and in my efforts to get him to eat them I end up using breads and meats to “sneak” them in so I know that if he gets enough green veges then he’s getting enough grains and proteins. He also loves milk and dairy products so that’s easy and he will eat fruit until he pees pulp-free juice if I let him! Color is important to consider as well (notice I break up veges into “orange” and “green”). I try to give Kye a variety of color in his diet and try to give him some purple fruit everyday!
! I have NOT purchased any of the actual cookbooks to come up with recipes but I’ve hunted the internet and have found some really great ones. I’m working hard on my sister blog to get all of these posted for those of you who want to try them! You all know I’m a schedule freak but I actually don’t have any exact science to what I feed Kye each day. I’m a little more easy going than you probably thought (or not?)! But here is a rough break down of what I typically feed Kye. I firmly believe it’s important to feed children only at their scheduled times as I believe having access to food all day on demand leads to obesity type lifestyles. However, I’m also a mama and when my growing boy begs for food at the pantry I am known to give him some raisins or other healthy snack to push him through to the next meal. We also don’t do juice. Kye enjoys fruit and fresh (or frozen) fruit is much healthier than juice that is made with un-natural ingredients and sugars. If Kye were a juice drinker I would not allow him to drink it all day long. Milk is only allowed at meal times but I will allow him to carry around a water sippy if he wants as I believe a love for water promotes healthier living later in life! When buying foods for our family I do my best to get the healthiest options I can. I know companies make their products look healthy (like Gerber’s stuff says “made with 100% real fruit” so you’d think it’s healthy but in reality the product only has like 1% fruit but they can say it’s 100% real b/c that 1 percent in the product is 100% real fruit…so tricky!) and will trick us into buying things and thinking we’re doing great on the health food front when in reality we aren’t. I make it my goal to feed Kye as little processed food as possible and buy all fresh or frozen. I used to be a big canned vege girl but it’s simply not as healthy as frozen. I don’t do those little pre-made fruit cups either as they are loaded with sugar to preserve them. The fruit cups I buy Kye are FRESH fruit only! PBJ: whole wheat bread, peanut butter, apricot preserves (preserves are healthier than jelly! ), and mashed up butter beans (or avocado). Great for on the go and at church too. I also make this on whole wheat English muffins for variety (typically I’ll just do the butter beans and pnut butter on 1/2 an English muffin) or even on graham crackers! Wraps: 1/2 whole wheat tortilla, 1-2 slices of lunch meat (typically turkey), 1 slice of cheese, and mashed up butter beans (or avocado). Great for on the go and church! Peanut Butter and Banana Muffin: usually 1/2 a muffin or a whole one depending on what else he’s eating and I usually spread a little peanut butter on it as well. Sweet Potatoes: I either bake them or make Sweet Potato Fries. If baked I will often put a dash of cinnamon on them to make them a little sweeter for him. They are also great for on the go or at church! Stir Fry: Kye used to adore this and it was a great way to get in his veges but lately he’s been more picky about it. I still try it though as kids will go through stages of not liking something then they will suddenly like it again so never give up! Hot Dogs: I typically don’t do hot dogs at home. But they are great for church and great for when he stays with someone as they are an easy food. I know you’re probably shocked I allow them at all but they aren’t so bad as long as you buy 100% beef (or turkey) ones! Also I always make sure to cut them very small as they are a choking hazard. Fruit: I use fruit for “dessert” at most meals. We ALWAYS have a fresh fruit mix in our fridge (you can get them at any grocery store) which typically have a mix of whatever is in season including honeydew, watermelon (Kye’s fav! ), cantaloupe, pineapple, grapes, and strawberries. He likes it all! I also always keep frozen grapes, blueberries and raspberries in my freezer. They thaw out very quickly and make a great yummy treat especially when teething. Again, always cut them very small as grapes are a BIG choking hazard! Since Kye gets banana at breakfast and bananas can bind you up I don’t typically give them to him again during the day. Same goes for prunes. He gets one at breakfast and they typically make you go-go so I don’t overdo it on those either. Raisins are another one of Kye’s favorites and I’ll give him those after he’s eaten all of his lunch as well. I have yet to find a fruit he doesn’t enjoy: kiwi, apples, pears, peaches, strawberries, the list just goes on and on. Left overs: Typically lunch will include left overs from dinner the night before. Kye’s favorites are mashed potatoes, cream corn, and pretty much any main dish. I will often give him leftover dinner rolls (as Zach and I can never finish them all!) and I will mash up butter beans and sneak it into the rolls. He enjoys them and it’s a good way to get in those green veges! Snack: Kye gets any left over milk (although there is rarely any left by that point) and/or ice water. Snack is still pretty big as my child just likes to EAT! , or any other Gerber snack. Some of the Gerber snacks do include some not-so-great ingredients (I don’t actually know how to read labels I just know you want the list of ingredients as short as possible with as many words as you actually know) but overall they aren’t too bad and they are really EASY! Frozen Ban-Ola: This isn’t something I do super often because it doesn’t have many things that Kye won’t eat on his own but he LOVES it and when he’s teething I like having this as an option. Crackers: After comparing lots and lots of labels I like just plain graham crackers over non-salted Saltines or animal crackers. Kye enjoys them and I often spread some peanut butter on them (mixed with butter beans of course) or even a snack cracker spread on them. They are a filling snack which is good because Kye will often get hungry before dinner. Apple Breakfast Bars: I know they have “breakfast” in the title but I use them for snack. If you haven’t noticed yet I prefer to make a bunch of healthy things in advance and freeze them for easy feeding at meal times. I know some people may prefer to make things right before serving but I’d rather take one night and just bake/make a BUNCH of stuff and be done with it (cooking is not something I enjoy at all). String Cheese: It’s one of my favorite snacks! So great for on the go and so easy for me at any time. I tear it into fourths then tear those into little pieces as Kye isn’t old enough to do that on his own. I only give Kye 16 oz total a day of whole milk because I like to be able to offer him a variety of dairy options. Yogurt: Another dairy option I enjoy for snack is mixing some plain yogurt with fruit. I use any fruit I have and Kye loves it. Popsicle: I haven’t actually given him the recipe I’ve made for Surprise-icles yet but I’m pretty sure he will like them and that they will be on the rotation for snack time especially in the summer months. because they are a “cookie” and take FOREVER for him to eat. Brownies: Now that I found this recipe for Carrot and Spinach Brownies I feel good about giving this dessert! I sometimes will even give him 1/2 of one at lunch. Goya Maria Cookies: I saw these suggested on some parenting site as they are cheaper than the brand name teething biscuits and healthier too! They make a great dessert as they take a while to eat (but not as long as the Gerber Biscuit) and are little cookies so it feels more dessert like. I know I am far from perfect with what I feed Kye but I feel content in the fact that I do my best. I plan on hunting down MANY more recipes for things I can make in order to “sneak in” healthy foods for him. I have found many but I, like I mentioned, prefer ones that I can make in advance and freeze so that makes things a little trickier. I hope that all of this will help some of you who are probably struggling with what to feed a toddler and I’m hoping that maybe some of you have some suggestions for things I haven’t thought of! Please share!!! So excited I came across this post via Interest. My 15 month old used to eat veggies like a champ and now nada. I'm relieved that I'm not the only one out here facing the challenges of feeding a one year old. This is such a great resource and thank you for the food pyramid explanation! All the resources from doctors offices have crazy recommendations that seem to be portions that I, as an adult, would eat.